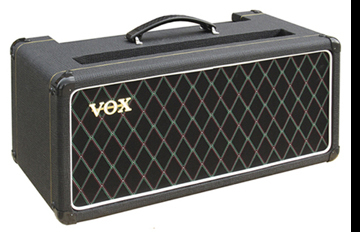 When Vox introduced the AC-50 amp head in late 1963, it lacked the treble of their popular AC-15 and AC-30 models. The engineers at Vox determined that adding a mid range horn to the AC-50 speaker cabinet was the most practical solution to this lack of high end response. Unfortunately, Vox didn't have much time to thoughtfully design a new guitar cabinet for the AC-50 head. The pressure to supply AC-50 amps and cabinets to the Beatles in late 1963 forced Vox to add a Goodmans Midax horn to a slightly modified AC-30 speaker enclosure. The slender proportions of the AC-30 cabinet required the magnet of the Goodmans Midax horn to awkwardly protrude through a hole in the rear panel. Vox decided that they would take care of the Beatles needs first and design a "proper" AC-50 cabinet later. There is no evidence to support that the early AC-50 "Small Box" speaker cabinets supplied to the Beatles were ever offered to the public. 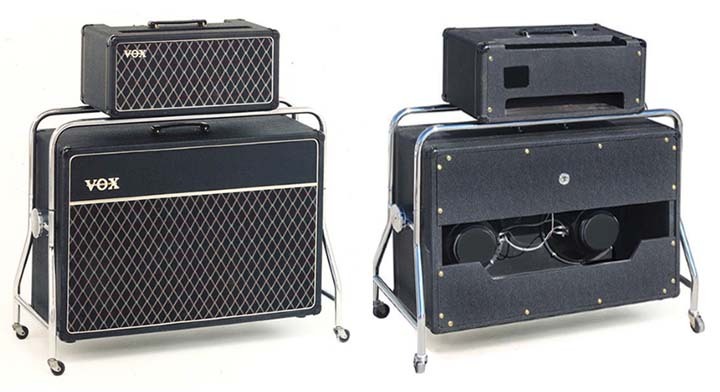 By August 1964, a new guitar enclosure for the AC-50 was ready for the market. The new AC-50 "Big Box" enclosure included two 25 watt 12" Fane speakers and one Goodmans Midax horn. The larger size of the enclosure (~33" x ~22" x ~11") allowed the magnet of the Midax horn to be fully enclosed inside the cabinet. Like the originals, the Vox AC-50 "Big Box" cabinet by North Coast Music is constructed from 3/4" 13 ply baltic birch plywood, including the baffle board. The original JMI Vox cabinets had particle board baffles. The cabinet is covered in traditional black basket weave pattern vinyl and black Vox diamond grill cloth. Eight one pin corners, half lap joinery, one NCM-074 handle, a three pin speaker jack and all speaker mounting hardware are included. It weighs approximately 50 pounds less speakers. This cabinet accomodates two 12" speakers and one Goodmans Midax horn. The mounting hardware for the speakers is included with the cabinet along with an original style Switchcraft 3 pin jack that has a twin lead 20" internal speaker wire. 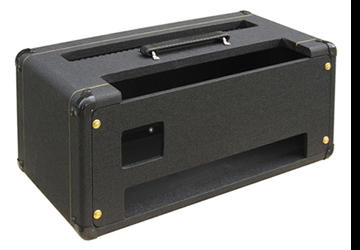 This reissue AC-50 "Big Box" enclosure is authorized and licensed by Vox Amplification, UK. Continental US sales only. Please allow several weeks for delivery from time of order. 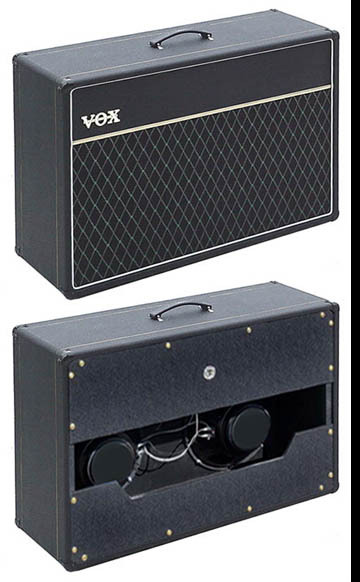 Vox AC-50 "Big Box" Speaker Enclosure by North Coast Music with speakers but no swivel stand - Same as above but includes two Eminence 30 watt 12" guitar speakers. The cabinet is rated at 60 watts RMS and has a 16 ohm total impedance. Continental US sales only. 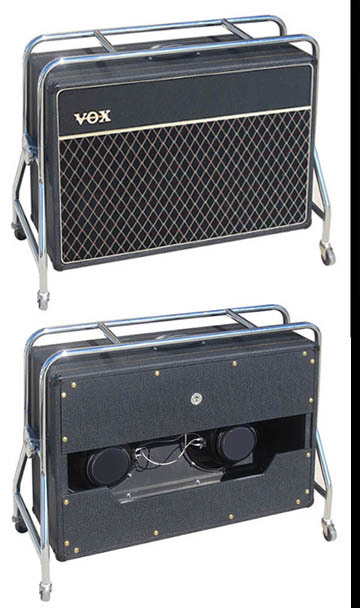 Vox AC-50 "Big Box" Speaker Enclosure by North Coast Music with swivel stand, no speakers - As NCM-163 above but adds chrome swivel trolley. Ships by Fed Ex in two cartons for the enclosure and trolley. Requires installation of trolley (takes about five minutes). All holes are predrilled and all fasteners are included. Continental US sales only. Vox AC-50 "Big Box" Speaker Enclosure by North Coast Music with swivel stand, and speakers - As VAP-163T above, but adds two 12" 8 ohm, 30 watt Eminence guitar speakers to the enclosure, installed and wired to a 16 ohm load. Continental US sales only. Prefer to purchase on Reverb? AC-50 Mk III and Mk IV "Tall Box" Amp Head Cabinet by North Coast Music - An extremely accurate replica of the "tall box" AC-50 head cabinet produced by JMI Vox from 1965 through 1969. Designed to fit any JMI two channel, gray panel AC-50 amp chassis and slider board. Constructed of 13 ply baltic birch plywood and covered in original style basket weave vinyl, this cabinet will make your old, beat up AC-50 "tall box" amp look like brand new. 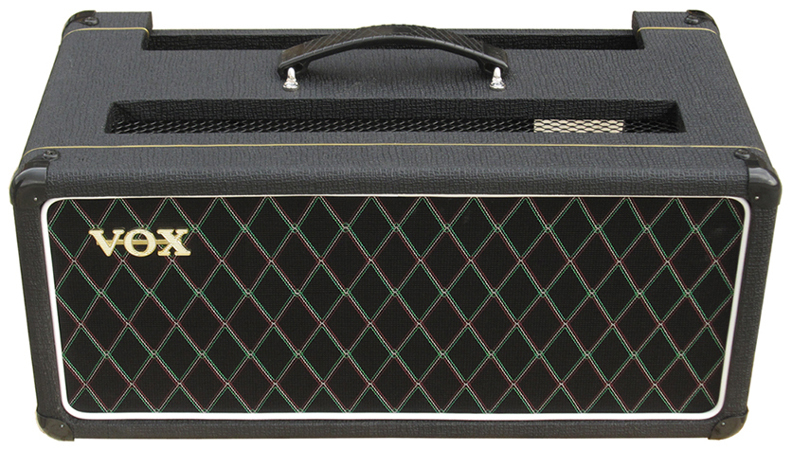 The cabinet features locking half-lap joints, eight one pin corners, a "small" Vox logo, reissue black Vox grill, one NCM-074 handle with a raised diamond pattern. The rear panel is fastened with to the cabinet with four 10-32 brass oval head machine screws that thread into steel back screw inserts. Four feet with mounting screws are provided but not installed, allowing you to choose the proper location for your application. Slider rails are mounted to the left and right inside panels to accept your original JMI chassis slider board. North Coast Music also offers replacement slider boards at an extra cost option. Inside Dimensions, Less Internal Strips: ~20" W, ~8" H, ~9½"
Control Panel Cutout: ~15⅞" x ~3." Also available for a slight additional cost is the aluminum vent grill used on the inside top of the cabinet. You may also choose to reuse the grill from your old cabinet.